The Gables Inn is a fully recreated, 100 year old classic Berkshire 'Cottage' built in the Queen Anne style, fully capturing the true essence and elegant style of the late nineteenth century. A visit to the Inn is to return in time. Only a mile from Tanglewood in the very heart of historic Lenox, The Gables Inn offers 19 lavishly decorated rooms and suites with private baths. This elegant Inn also offers a heated indoor swimming pool, a new private tennis court and perhaps best of all, a lovely, quiet garden in which you may reflect in peaceful solitude. This former Wharton family home has undergone extensive reconstruction under the enlightened stewardship of its proud owners, Mary and Frank Newton. The Newtons have lovingly furnished the Inn with authentic period furnishings graced with their own personal collection of fine art which spans five centuries along with rare documents and books. A delightful breakfast is graciously served each morning in the breakfast room featuring chef-baked breads and pastries, fresh fruit, coffee and juice. Through all the seasons of the year, the Berkshires are a glory to the spirit and a solace to the soul. In addition to the music of Tanglewood along with Jacob's Pillow, America's oldest center for the dance, there are countless other cultural offerings to enhance the natural magic of this place. Come join us, come spend a few days at The Gables Inn. Step back briefly to another time, another place...revisit the Gilded Age. 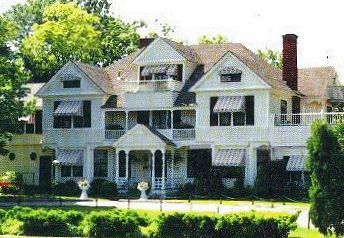 This and other Lenox Bed and Breakfast Inns can be found here online in The Register.